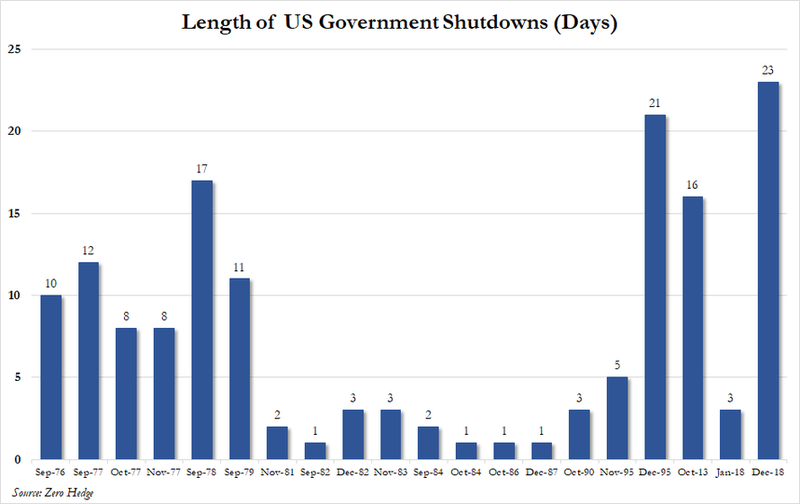 The partial government shutdown, now in its 23rd day, is officially the longest in modern US history as the impasse over funding for Trump's southern border wall continues. With Congress out of town for the weekend, President Trump tweeted: "I'm in the White House, waiting. The Democrats are everywhere but Washington as people await their pay. They are having fun and not even talking!" Well, they're not all "not even talking" - as evidenced by Sen. Bob Menendez (D-NJ) hanging out in Puerto Rico along with more than two dozen Democrats from the Hispanic Caucus. Menendez was spotted talking to a bikini-clad woman. President Trump says he won't sign any spending package that does not include $5.7 billion for his wall - leaving nine of 15 major federal agencies without congressional funding since Dec. 22, according to the Wall Street Journal. "I do have a plan on the Shutdown," Trump tweeted on Saturday. "But to understand that plan you would have to understand the fact that I won the election, and I promised safety and security for the American people. Part of that promise was a Wall at the Southern Border. Elections have consequences!" Without a clear solution, Trump could make good on his recent threats to declare a national emergency and divert funding from other departments to build a wall without congressional approval - a move which could pave the way for the shutdown to end, yet leaving the wall in the hands of the courts. And while wealthy Washington bureaucrats play chicken, hundreds of thousands of federal employees missed their first paychecks Friday, ratcheting up pressure to end the shutdown. That said, there is enough temporary funding for millions of Americans to continue to receive food stamps through February, according to Agriculture Secretary Sonny Perdue - while the IRS will pay tax refunds despite the agency being subject to the shutdown. "I don’t want him to do that," said Rep. Roger Williams (R-TX) of the national emergency option. "I would hate to see that money moved around." Another wall funding option panned by both parties is asking the US Army Corps of Engineers to explore diverting funds allocated in 2018 to projects providing disaster relief for Puerto Rico, Texas, California and Florida. "It’s going to piss off a lot of members," said Rep. Mike Simpson (R-ID), who sits on the House Appropriations Committee. GOP Senators, meanwhile, are trying to come up with a solution that they hope will end the impasse. The bill from Portman and Moran would allow so-called Dreamers to renew their protected status every two years. Trump, meanwhile, wants to address DACA - the Obama-era law governing Dreamers, after the Supreme Court has weighed in.